Read below a full Fisher Price RAINFOREST BOUNCER REVIEW! The Fisher Price Bouncer can be used for newborns until they can sit up without assistance. It's a great way to keep the baby happy, while in a safe place where he can rest or play. A lot of bouncers will have your baby sleeping, but this one keeps your baby awake based on the reviews moms shared online. If you want the baby to sleep you can place him in bed, but the bouncer will keep him awake while soothing him and keeping him entertained. Rainforest theme will keep the baby in a fanstasy world. Every detail was worked on to provide a delightful experience and encourage a healthy mental and physical development of the baby. There are several lights and sounds that are designed to grab the attention and keep your little one entertained. There are two modes of activating these features. One is parent activated and consists of six longer songs. The baby activated ones are six shorter ones, that start to play when the baby moves the toys. The toys provide a stimulating and entertaining action. There are sound effects to reward the baby when he plays with the toys, animals put on an engaging peek-a-boo show and so on. However, if you want to relax the baby and prepare him for a nap, you can easily remove the toy bar. For better calming results you can also turn the vibrations on and maybe tune down the music volume. The measures are 19.3 inches X 17 inches x 5.1 inches (W x H x D) and the weight is 8.4 pounds. It's very easy to move it around the house to the place you need. Fisher-Price offers a one year warranty for the bouncer, in order to keep worries away. The product is quite sturdy so you can plan to use it for more babies if you would like so. 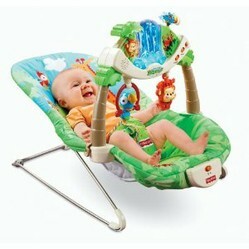 Fisher Price Rainforest Bouncer is a bestselling bouncer for a reason. It is a high quality product that keep your baby safe and happy. The value for money is also great, especially if you purchase it at a big discount - enjoy the best price via clicking the image above to follow the link to Amazon. Serta is one of the top producers of crib mattresses. Get a review of the best models they have to offer! Read below a full FISHER PRICE PAPASAN CRADLE SWING REVIEW! Read below a full Graco Nautilus 3-in-1 Car Seat REVIEW! Can Cloud b Twilight Constellation Night Light soothe your little loved one's night time Boo-Boos? Read the review to find out!